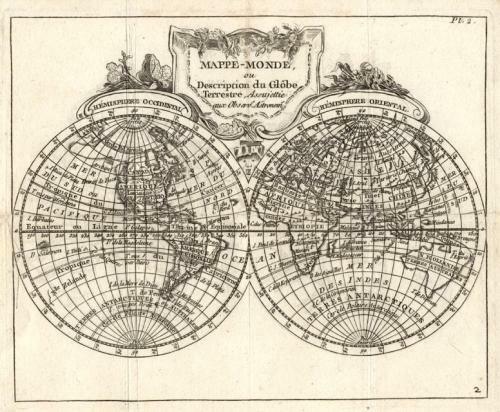 SOLD Mappe Monde, ou description du globe terrestre, assujettie aux observs. astronoms. Title: 'Mappe Monde, ou description du globe terrestre, assujettie aux observs. astronoms'. An interesting double hemisphere map of the World. Tasmania and New Guinea are still joined to Australia. A speculative North-West passage is shown between Hudson Bay and the mythical West Sea. To the east of South America is a note saying 'Terre vue par Davis' - probably the first sighting of Easter Island.